In January 2008 (yes 2008!) I posted a quick shot of my low key painting project mainly to test my then new camera. I was inspired by Paul Baker’s work but wanted to try 15 mm. In the intervening fours years I have painted quite a bit of stuff for this project, including the elephants, but I have to admit to being sidetracked and painting an Armenian ally to morph my Mongol Conquest army into an Ilkhanid army. I’ve also decided that I’d like a full Timurid army not just a DBA painting project based around a core of figures that I may extend into the early renaissance. Nothing like making things easier. So, I hear you ask, what’s the break through? Well the first thing that’s changed since I last attempted this pattern is my use of standard reading glasses and a magnifying glass. I started using them in late 2009 and two years on I’m fully accustomed to them and the way they change my depth of field during painting. The second thing is that for certain colours, like the red above I’ve started using an undercoat (in this case burnt umber) which gives a much more solid top colour than painting directly on to black. I also use this for fine detailing where the final colour it painted inside the shape created by the under colour given a nice impression of depth. See my Armenians for examples of this technique. The final thing is much more recent. Normally I use a 2/0 Isabey 6228 Kolinsky Sable brush for all but the bulk work but in the last three or four months I’ve been using a 2/0 Pro Arte Series 107 Spotter for the fine detail work. This has made painting the squares so much quicker and more accurate. 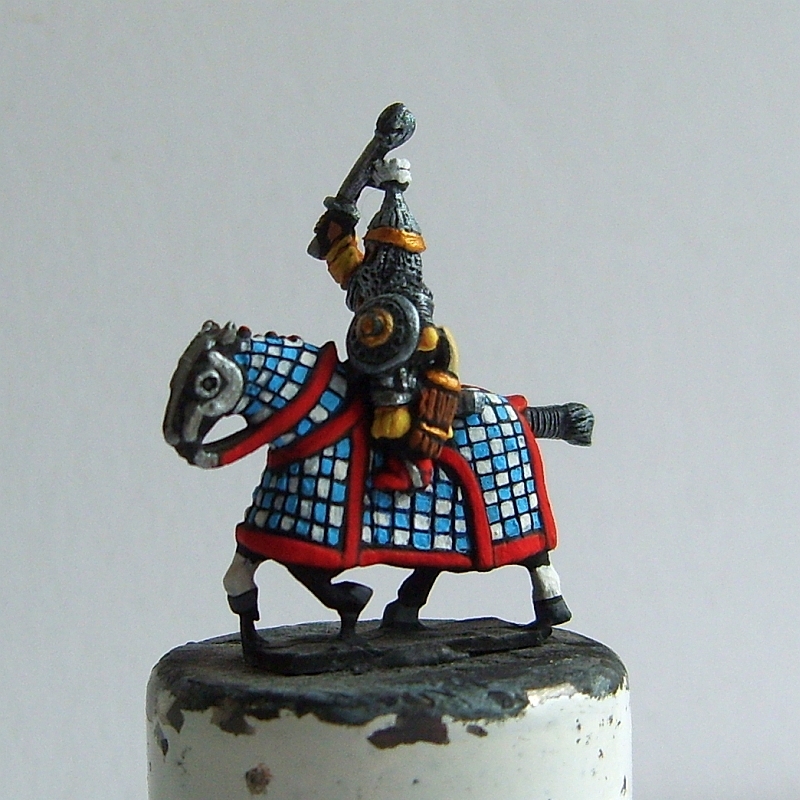 So it looks like the task of painting the patterned horse armour won’t be the frustrating chore I thought it would be. Only another three dozen to paint. I've tried to find a US distributor for Pro Arte series 107 and there is NONE. Any chance you might sell this or even a set of 107s? I'd pay a bounty to give it a try. "Most of the belly has been incorporated into the ferrules. Very little of the brush is in evidence but the tip is very sharp giving great spring and precision in use ..."